Can switching to organic foods make a difference to employee health and nutrition? There are many claims about the benefits of organic foods. Unfortunately, the current research is equivocal regarding the validity of these claims. There are medical, environmental, and financial factors to consider when deciding whether to go organic. Consider the following pros and cons. Pesticides are not used in organic foods; natural compounds are used instead. Many health risks, such as cancer, are associated with pesticide use. Organic foods must meet many USDA qualifications before they can be marketed as organic. Use of organic compounds on animals means that they are not fed antibiotics or growth hormones and that they are fed organic food. The downside to organic is that these foods tend to be more expensive. This can lead to a difficult decision in the grocery store between apples that look the same but vary in price. 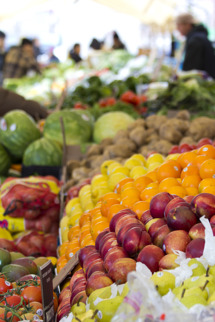 Organic produce may spoil faster than fruits and vegetables sprayed with pesticides. Because they don’t have the wax-like coverings on them, they can go bad more quickly. Products that have the wax coverings should be labeled, indicating that a product was used to increase shelf life and decrease the occurrence of disease. If certified organic, the food will have the USDA certified organic sticker on it. Food must be at least 70 percent organic to be able to have the USDA certification. Natural means that there aren’t any artificial sweeteners, colors, flavors, or preservatives. Ultimately, you need to decide for yourself what is best for your family, lifestyle, and checkbook. Checkout our quickread for NIFS top nutrition apps for healthier eating, click below.